A stroke is the equivalent of a heart attack occurring in the brain. It is sometimes described as a "brain attack" and it can happen to anyone. The brain requires a constant supply of oxygenated blood in order to maintain itself. A stroke is triggered when blood supply and circulation is suddenly shut off to a specific part of the brain. When the continuous supply of blood is stopped or disrupted cells in the affected area of the brain quickly begin to die from lack of oxygen. The destruction of cells from lack of oxygen during a stroke leaves a damaged area in the brain which leaves the person unable to control certain functions such as muscle movement or speech. The long-term impact of a stroke varies depending on how extensive the brain damage is and what specific area of the brain it occurs in. A minor stroke may only leave a very small area of damage and only cause temporary impairment of movements. By comparison, a bigger stroke may leave a sizeable segment of the brain damaged causing permanent paralysis in certain areas of the body. Only about 33% of people who suffer a stroke make a full recovery. The remaining 66% of stroke victims are left with some degree of permanent disability. Each year almost 1 million people suffer a stroke in the United States making it a very common health occurrence. Many of these strokes are relatively minor in nature, but the more serious strokes can cause devastating damage. Strokes are actually the number 1 reasons for physical disability in adults in the U.S. They can also be deadly. Stroke consistently ranks in the top 5 leading causes of death in the U.S. Most people think of a stroke as a sudden, unpredictable event that cannot be avoided, but this is actually not the case at all. Research indicates that at least 75% of all strokes are actually preventable. All strokes are generally caused by an interruption of blood supply to the brain resulting in damage from oxygen deprivation. Strokes are categorized into 2 basic subtypes based on the mechanism by which the blood flow is interrupted. Hemorrhagic Stroke: in a hemorrhagic stroke blood supply to the brain is disrupted when an aneurysm or a blood vessel bursts or ruptures and bleeds internally (hemorrhage). 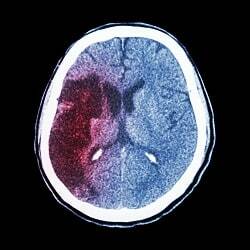 Hemorrhagic strokes are less common but they are usually more serious and more likely to result in death. Ischemic Stroke: ischemic strokes are more common and they occur when a blood vessel supplying blood to the brain becomes obstructed or blocked by a clot or some other event. TIA stands for transient ischemic attack. A TIA is not actually a full-blow stroke. TIAs are more like temporary strokes which occur when the supply of blood to the brain is suddenly cut off for a brief time period. The symptoms of a TIA tend to mirror those of an actual stroke but that usually only last for less than 24 hours and then go away. TIAs are important because they are frequently an early pre-cursor to a full stroke. In fact, 50% of all strokes are preceded by TIAs within a 48 hour period. Doctors routinely fail to timely diagnose strokes and the early warnings sign of a stroke, such as TIAs. A recent Johns Hopkins study found that early warning signs of potentially dangerous strokes are discounted or overlooked by doctors in thousands of individual cases each year. Most cases of failure to diagnose strokes or TIAs occur when someone comes to the emergency room with complaints of headaches or dizziness. Many of these individuals have suffered a stroke or TIA but are sent home with a benign diagnosis like migraines, vertigo or no diagnosis at all. The Hopkins study estimates that somewhere between 50,000 to 100,000 of these misdiagnosed stroke cases occur in hospital ERs each year. A large number of medical malpractice claims are based on failures to diagnose TIAs (often called "ministrokes") and other early warning signs of strokes. The reason for this is very simple. The symptoms of TIAs and other stroke pre-cursors are often very subtle and commonly associated with minor health issues. The vast majority of patients who come to the hospital with bad headaches are not suffering from a TIA, stroke or brain aneurysm. This causes doctors to overlook or discount these symptoms without performing testing to rule out any connection with TIA or stroke. No matter how seemingly benign a person's symptoms may be, doctors have a duty to rule out stroke or TIA. Checking vitals and sending someone home with Advil is not adequate medical care. Failure to perform sufficient testing to ensure symptoms are not associated with TIA or stroke can be grounds for medical malpractice. Strokes can have very devastating consequences including paralysis and death. This makes failure to diagnose TIA or stroke a potentially high value malpractice claim. Listed below are a number recent verdicts and reported settlements from cases in which doctors failed to diagnose a stroke or warnings indicators. Cachaldora v First Baptist Hosp. (Florida 2018) $4 million: middle aged attorney goes to the hospital with abdominal pain and is initially diagnosed with a bowel obstruction and a splenic infarct. Doctors order a hematology consult but he is discharged without the hematology consult having been performed. A few days later he suffers a stroke triggered by bacterial endocarditis, a condition which would have been diagnosed in the hematology consult. He sues the hospital claiming that nurses and staff negligently discharged him without referring him to the hematologist which would have led to diagnosis of his condition and prevented the stroke. A jury in Miami finds the hospital and 3 nurse were at fault and awards $4,020,000 in damages. Plaintiff v Defendant Internist (California 2017) $2.2 million: woman in her mid-40s with history of hypertension and migraines suffers severe headaches, numbness in her right and vomiting at work. She calls her doctor to report the symptoms and he tells her there is nothing to worry about and to take 2 Advil. The next day she suffers a massive stroke leaving her with partial left-sided paralysis. She sues her doctor claiming that the stroke could have been prevented had her appreciated her symptoms and advised her to go to the hospital. In defense the doctor claims that immediate hospitalization would not have made any difference. The case goes to arbitration and the arbitrator awards $2.2 million in damages. Haveman v Oregon Emergeny Hosp. (Oregon 2016) $3.7 million: a 38-year-old elementary school teacher and mother is admitted to the emergency room after suddenly collapsing at home. A CT scan is done but the radiologist interprets it as normal so doctors conclude that she had a panic attack from stress and they put her on anti-anxiety medication. The following day her face was noticeably drooping and another round of tests revealed that she had suffered a stroke. By that time is was too late to give her blood thinners or operate and she suffered permanent disability and was unable to return to her teaching job. Defendants deny any wrongdoing but a jury in Portland finds that the emergency room doctor misdiagnosed her and awards $3.7 million. Orr v Bell (New York 2016) $11.6 million: aerospace machinist in his late 30s goes to emergency room with dizziness, inability to stand, and headache. He is most likely suffering a TIA but a CT scan of his brain is done and the radiologist reads the imaging results as normal so he is sent home with a diagnosis of vertigo. His symptoms eventually go away but several weeks later he suffers a massive stroke which leaves him 100% disabled. He sues the radiologist for failing to diagnose his TIA / ministroke the first time. Had the TIA been properly diagnosed at the hospital earlier blood thinners would have been prescribed and prevented his subsequent major stroke. The radiologist claims he was not given enough information by the emergency room doctors. After a lengthy trial the jury only takes 3 hours to award $11.6 million in damages. If you think you might have a medical malpractice claim based on a doctor's failure to diagnose your stroke or TIA, contact the stroke malpractice lawyers at Miller & Zois today for a free consultation. Call us at 800-553-8082 or get a free online consultation.